Cassava cake is a very popular dessert in the Philippines, and Reese is making one for her friends to try when they come to visit. Browse content similar to Reese's Filipino Cassava Cake. Check below for episodes and series from the same categories and more! Hello, my name is Reese and this is my house. Come in. And this is my kitchen. Today I'm going to be making cassava cake. It is really, really yummy and it is my favourite pudding. Reese has learnt how to make cassava cake from her mum, Rhia. and her family originally come from the Philippines. who sometimes eat up to five small meals a day. Cakes covered in coconut are very popular. Reese has washed her hands, put on her apron and she's ready to cook. Today I'm going to be making cassava cake for my friends. round for a very special cake from the Philippines later. -It feels a bit like glue. It feels wet and slippery. It tastes a bit plain. If it was cooked differently, I wouldn't mind trying it. -Erm, I don't want to eat it. if the egg is good or bad. You also want to see if the egg has got any shells in it. Keep an eye out for any eggshell. -Oh, there goes the second egg. -Now we're going to whisk the eggs. We are going to add in our two eggs into the bowl. -I'm going to wipe my hands with some tissue. I'm going to add in our coconut milk, followed by our coconut cream. Now we are going to add in 80ml of milk. Now we're going to add in some vanilla extract into the bowl. Vanilla extract will give it some flavour. Now we're going to add in some sugar into the bowl. Ah, that's the idea, Reese, give it a good mix. Now we are going to add in our most important ingredient. Cassava. Cassava is a plant that grows in the Philippines. They can grow very tall, taller than people. which are often used in cooking. and used in sweet recipes, such as cakes. including flour, bread and even baby food. Reese is using frozen cassava chips today. Now we're going to add in our cassava into the grater. and you don't want to cut any of your tiny fingers! Ooh, this is getting really hard. In comes the struggle, out comes the muscles. And if you find it tricky, ask a grown-up to help you. Now we can add in all of our cassava into the bowl. And we're going to add in half of our cheese into the mixture. because we're going to use that for the topping. And now we can mix this until it is well combined. -but it really is yummy. because this is a very popular cake in the Philippines. I've been to the Philippines and it is really, really hot. so much delicious things in your cake. I love Filipino food so much. I think this is ready now. Now I'm going to add this into our baking tray. Grease the tin with oil and with this brush. Brushing it onto the pan. If you don't grease the sides, then it'll be really hard to get out. Now we can add in our mixture into the bowl. The mixture smells like coconut. And now we can sprinkle the rest of the cheese on top of our mixture. HE CHUCKLES What are you going to do now? around the areas, you want to get a grown-up to put it into the oven. -Now we are going to cut up some fruit. and even tastes like a fruitcake. and that's a really clever way to cut up watermelon. -These are looking really, really yummy. we can wait for the cassava cake to be ready to eat! and pour it into a bowl. Do the same with another egg. and add that to the bowl, too. and give it all a really good mix. and tip the mixture inside. ..so you can serve it with your cassava cake. so she can share her very special Filipino cake with her friends. Aw, well done, Reese, your table looks really good. -Everyone's washed their hands and is ready to eat. This must've taken you ages, Reese. I like how you made the shapes of the fruit. and we are going to put our food onto it. Is Filipino food your favourite? Here comes my mum with the food. Here's your cassava cake. It looks really nice. Wow, just look at that. and the fruit decoration makes it look very, very special. And you can see, look, the cheese has all melted. Do you remember when they first tasted cassava? Nobody was very keen on it. when they taste Reese's cassava cake? Let's hope so. -The flavour and the texture's really nice. So, guys, do you know what the special ingredient is? -Correct. Did you like it? when it's cooked in your cassava cake. Thank you for coming to my world kitchen. 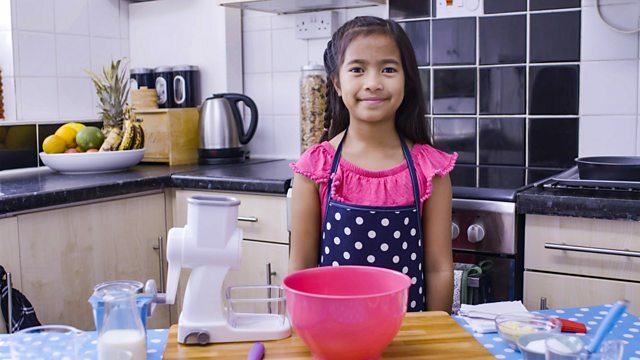 Cassava cake is a very popular dessert in the Philippines, so Reese is making a very special version for her friends to try when they come to visit. Reese's family come from the Philippines and this recipe is a family favourite. This is a cake that has lots of savoury ingredients such as cheddar cheese and cassava but also includes sweet flavours such as condensed milk and coconut cream. Cassava is a root vegetable and tastes very different when it is eaten on its own, so Reese is hoping her friends will like the taste of it when they taste it in her cake. She's even preparing some delicious fruit to serve alongside it.